Credit Mills is a fairly recent addition to the list of luxury neighborhoods in Mississauga. Largely built during the 1990’s, Credit Mills, while lacking the extensive tree canopy that is found in many of the older Mississauga areas, has something that they don’t have – newer housing stock, with all the incredible luxury features that demanding homeowners want today. Here you will find homes for sale with features such as triple (3) car garages, ensuite bathrooms in every bedroom, vaulted ceilings in “great rooms”, incredible kitchens with massive counter and cupboard space, and much more. Credit Mills is technically part of Streetsville, and is nestled between Mississauga Road to the east, and Erin Mills Parkway to the west, with its southernmost boundary at Eglinton Ave where it blends into an area known as The Chase, and its northern edges just south of Britannia Road at McFarren Blvd. Most Credit Mills homes are newer built, and they are large – often 3000 square feet and up, and they are situated on lots that, while not as massive as those in older areas, still offer plenty of space for growing families. Credit Mills is a relatively compact area with only a few streets, and with a distinctive look that separates it from other areas of Streetsville and Erin Mills. Driving north from Eglinton along Mississauga Road, the large homes become immediately apparent, and this perception continues as you proceed west along Erin Centre Blvd. Credit Mills homes can be found on streets such as Erin Centre Blvd., Forest Hill Drive, Manor Hill Drive, Robinwood Court, Silverwood Drive, and Barbertown Road. There are several small court locations with some of the biggest, and most expensive homes – Tiffany Court, Hilton Court, and Rothesay Court, to name a few. There are a few forested areas, such as Bonnie Brae Park, Erin Woods Park, and F.B. McFarren Memorial Park, providing welcome respite from the urban experience of life in the city. While the majority of homes in Credit Mills were constructed during the 1990’s, there are still a few lots where builders are active. See the form at the bottom of this page for more info. You can see that prices have ranged between 1.6 and 2.4 million dollars for these luxury homes. 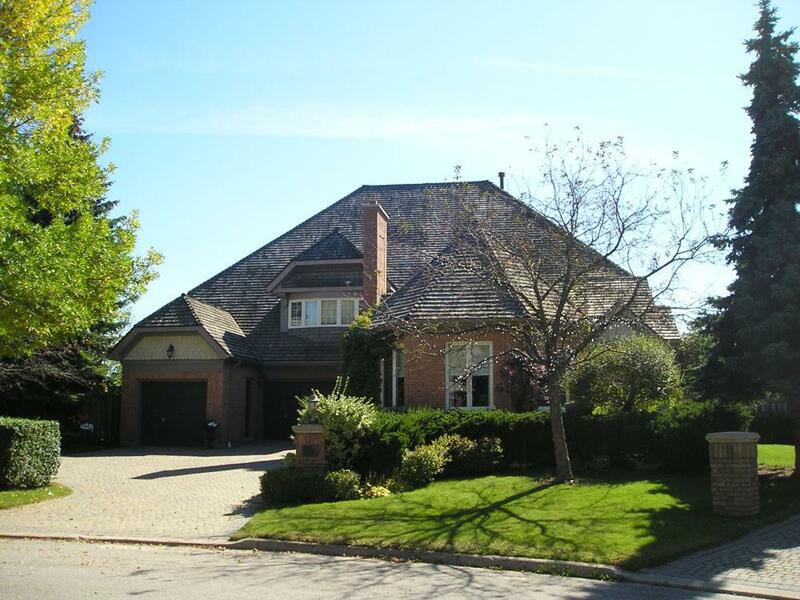 When you compare prices of these large homes to other premium areas in Mississauga, Credit Mills is comparatively a good bargain, especially when you consider that these newer properties include so many of the luxury features that older homes do not . Adding to the attractiveness of the area is its good location -commuting time to Erin Mills Town Centre shopping mall is about five minutes by car, and to the Credit Valley Hospital also about five minutes away. Credit Mills is situated nearly equidistant between the 401 and 403 highways, making commuting relatively easy. The nearest GO Train station in the area is Streetsville, on the Milton Line. Credit Mills is also blessed with excellent schools, including John Fraser Secondary School, which is one of the highest ranked schools in the Greater Toronto area, and indeed in all of Ontario. Thus ends our short overview and photo tour of Credit Mills homes, containing some of Mississauga’s finest and most expensive properties. We hope you have enjoyed the tour, which completes part 6 of our ongoing series on the luxury neighbourhoods of the City of Mississauga. For more information on Credit Mills, see below. REGISTER NOW to get the information you want on Credit Mills real estate, it’s easy, and there is no cost or obligation.